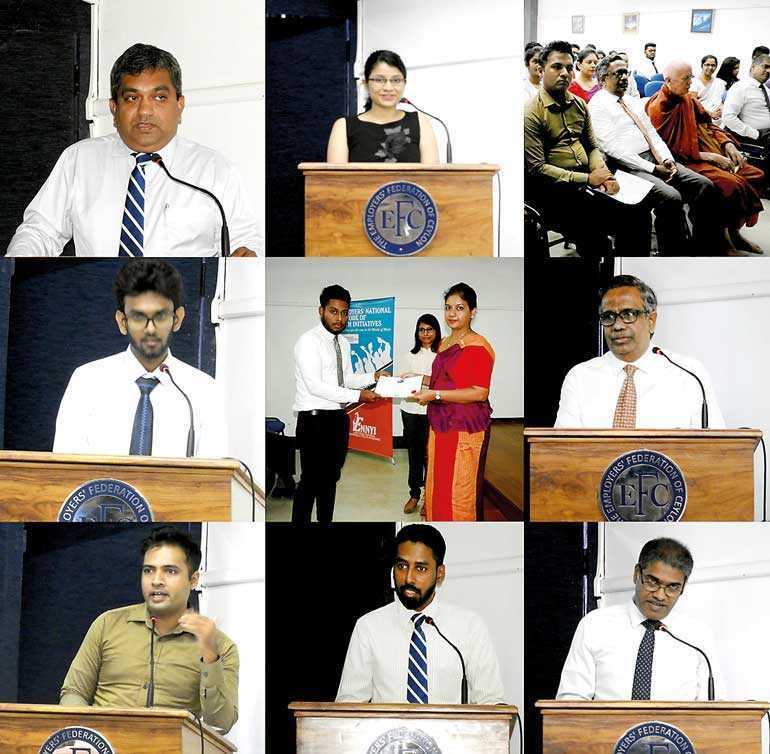 The Employers’ Federation of Ceylon (EFC) in collaboration with the Prime Minister’s Policy Development Office, Virtual Higher Education College (Pvt) Ltd and the Dharmavahini Foundation, has initiated a program to offer scholarships for school leavers, job seekers and those already employed to read for a Bachelor of Information Technology (BIT) at the University of Colombo’s School of Computing. The first batch of scholarships was awarded at an event last week held at the EFC. The initiative was facilitated by The Employers’ National Network of Youth Initiatives (ENNYI), coming under the purview of the EFC. In his opening remarks at the event, EFC Director General Kanishka Weerasinghe urged young job seekers to avail themselves of opportunities the private sector enables. He noted that many are unaware of these opportunities, hence over-depending on the public sector for employment. Calling upon the business community to be more engaged with the State universities and other vocational training institutes in mitigating this knowledge gap, he went on to note that ENNYI aspires to become a bridge between the job seekers and employers. “As the voice for the employers in the country, we at the EFC are inviting undergraduates and other young job seekers to reach out to us and optimise on what we have to offer,” remarked Weerasinghe who pointed out that currently many internships, training and job opportunities are open through the EFC. ENNYI, which was launched by the EFC in enabling youth a window to the real world of work, is collaborating with several State universities and multiple Government agencies in spurring more job openings in the private sector. To facilitate this process, ENNYI, which is expanding its reach, has created a common portal www.empowerme.lk. The website is a practical tool for the potential intern and the employer to come to a common platform by enabling easy access of information to both parties. The course content developed for the BIT, as Virtual Higher Education College Director Jayanath Warusavitharana explained, goes beyond IT knowledge, offering a comprehensive 35-unit English course as well. The tailor-made course which is offered complementary for all scholarship recipients, is a convenient online course to enhance the knowledge of English, he said. Urging the students to reap the optimum benefits of the course which is a passport to employment, Warusavitharana went on to note that by 2020 the scholarship scheme will be expanded to offer 1000 scholarships. Elucidating on the multi-pronged benefits of the course, Dr. Nandaka Molagoda, representing the Prime Minister’s Policy Development Office, cited convenience, versatility and cost mitigation among its salient features. “Lessons are delivered online enabling students to access the content at their convenience,” said the economist, who emphasised proper time management to garner best results of the course. The event also rendered voice to several young beneficiaries who collectively lauded the financial benefits the scholarship scheme offers. They applauded the elimination of the cost factor both in terms of course fee, transport and other expenses which often hinders many, especially those from less privileged backgrounds, from pursuing such study programs.